Where to Find Appropriate Counter-revolutionary Dress for Women? Thank you for your informative TIA website. I especially admire your articles under "Manners, Customs, Clothing." Your articles have helped me grow into a young lady for Christ. I kindly ask you for your assistance with a dilemma, which is probably facing other young ladies who read your TIA website. 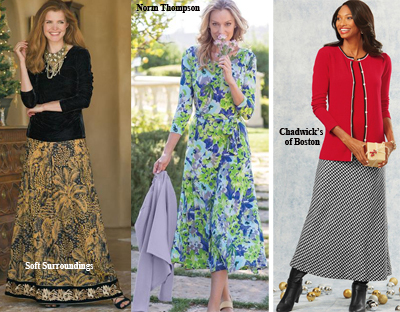 I am looking for modest, sophisticated and professional dresses/skirts that are similar to the fashions you recommend women wear on your cultural pages. More so, I would like a professional style A-line skirt/dress that is at or below 8 inches from the knee (in accordance with St. Padre Pio's rules for women entering a Church). I checked department stores like Bloomingdales, JC Penney, Burlington's, etc. and online stores like Amazon but the search was in vain. There is usually at least one quirk wrong with an outfit that seems "suitable": plunging neckline, rests way above knee, too tight, and/or excessive design. The only outfit that I found that fits what I envision is found on Marycrafts “Women's A-line shirt midi skirt suit set office workday.” I would like more outfits like this. Do you recommend stores or websites where I can buy modest and professional dresses/skirts with the qualities listed above? Thank you for taking the time to read this letter. Thank you very much for your help, Dr. Horvat! Thank you for your kind words and warm compliments about our Cultural Page. I am very pleased it has inspired you to be a cultured young Catholic woman in the very vulgar and debased society we live in today. I do not believe it is possible to follow the modern fashions and be truly and authentically Catholic. But, this does not mean that women are doomed to dress dismally or stand out for their frumpiness. Some effort and ingenuity can allow one to instead stand out for good taste and gentility. The Catholic woman should aim to be a exemplary model of Catholic femininity that encourages others to follow the same good path. Because today's clothiers as a rule do not cater to those who would combine modesty and elegance in dress, it takes more time and effort to achieve this effect. In fact, I often hear this objection: Isn't it vanity to spend so much time on clothing, time better spent in prayer or good works? Absolutely not, I respond. When all around us we see vulgar, immoral and even satanic trends and fashions, we have an obligation to make the effort it demands to set an example of decorum and refinement. For the Catholic woman, it is not vanity that inspires her to make this extra exertion to dress well, but a desire to appear well before God and her fellow man, with the dignity her social standing demands. Therefore, a woman in the work world would seek out more professional apparel, without the ruffles and frills that could appear to be trying to attract the men she works with. Ideally women should not be in office work places with men. But, this is an ideal world that we cannot have today. So, we must adapt ourselves as best we can. This type of professional clothing could be excessive for a woman in the home with a large family or on a farm; she would dress in a more simple and practical way, while maintaining modesty and inspiring the respect of her husband and children, as well as those she comes into contact with in her day-to-day life. It was common in the past for a woman to change from her "house dress" when she would "go out" shopping, to lunch with ladies or assist at Mass. There is a certain common sense – which makes up part of the well-formed Catholic spirit – that helps each woman adapt to her personal situation. As you probably already know, here at TIA, we do not offer specific rules or guidelines for women's dress: e.g. skirts 4 inches below the knee, blouses no more than two fingers below the throat, etc. What we do offer is principles for being modest and dignified. Doing so, we hope that this will inspire a lady – as it did you – to want to be modest, not just to make an impressive appearance in public, but all the time, even in the privacy of her home. Upholding dignity in dress is ultimately inspired by the desire to please Our Lord and Our Lady and give glory to God. It was this spirit that gave birth to the marvelous variety of regional dress in the countries of Christendom. It is this same spirit that will restore Catholic society and build the Reign of Mary. With these preliminary remarks, let me move on to the practical question you raised in your letter: Where can today's woman find graceful and feminine clothing? Since I am no longer young and my tastes are set in older classic models, I can only offer a few ideas and point to some clothing stores that have served my needs. Then, to broaden the scenario I turned to two younger women who follow the counter-revolutionary ideal and asked them for advice on where to find modest clothing. Where would I suggest finding the kind of clothing you mentioned – professional style A-line skirts and dresses? First, I would advise you not to ignore second-hand stores, consignment shops and estate sales. If you have the patience to sort through the racks, you will be surprised to find unique, well-made and beautiful clothing. 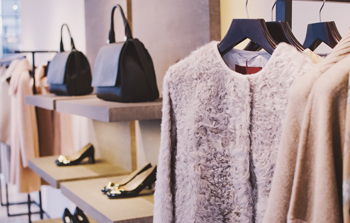 If you can find good quality garb in these consignment or thrift shops, soon you will have in your closet more classic clothing than what you can find at the shopping mall dress shops, which always aim to follow the latest styles and fads. 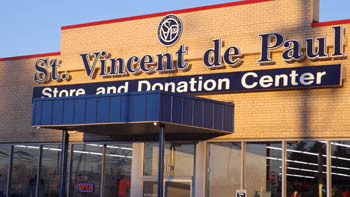 When many older persons clean their closets, their older and more traditional dresses, skirts and shoes are sent to the second-hand or thrift stores. Or, should they die, their children dispose of their "old-fashioned" clothing immediately. Their loss is our find. Another option is to shop from catalogs or online. 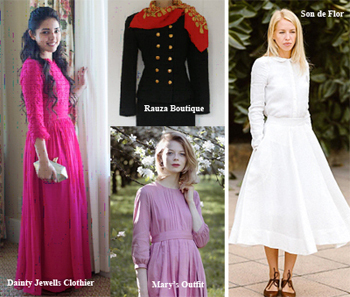 There are dress catalogs as well as online stores that offer some modest and quite elegant dresses, skirts and tops. A few where I have found suitable articles of clothing, accessories or shoes include: Chadwicks of Boston, Norm Thompson, Drapers & Damons, Travelsmith, Soft Surroundings and Coldwater Creek. As always, you have to look through a slew of inappropriate things to find something worthwhile, but such items are there to be purchased by the persistent shopper. By the way, my own policy is to purchase off-season from the online shops or catalogs. Items are reduced anywhere from 30% to 80%, and often the best prices can be found on the exact conservative clothing we are looking for. But, the clothing in these stores is still too expensive, one might object. Not really, I respond. If you purchase better quality classic clothing and shoes that will last for years, the cost can be viewed from a different perspective. I wear outfits that I have had for many years that still receive high compliments. 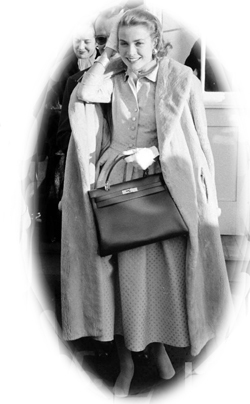 Instead of purchasing a multitude of cheaper clothing, my Aunt Clare, a very well-dressed lady, would purchase one complete high-quality outfit, including hat and shoes, twice a year (Spring and Fall). After some years her wardrobe was quite large, and her reputation as a finely dressed and dignified lady well-established. The final word I offer to all young women is to learn to sew. This feminine art used to be taught in high-schools and colleges. The feminist revolution that promotes women being like men, wearing pants, entering the work force, etc. changed the mentality of young women, making them eschew what they disparaged as "women's work." In revolt against the feminine arts, the modern woman rejected sewing, cooking, flower arranging, knitting and embroidery. They forgot that they were women, and these skills are not only suited to them and fulfilling, but play a large role in creating a well-ordered and beautiful home. The bare minimum of sewing is not difficult to learn: how to hem a skirt, take in a seam, sew on a button, patch a tear, etc. To know more is to open a whole world of fine clothing. When a woman can make her own garments, she can thumb her nose at the dictatorial fashion industry and design her own wardrobe, using the best of fabrics if she so desires. 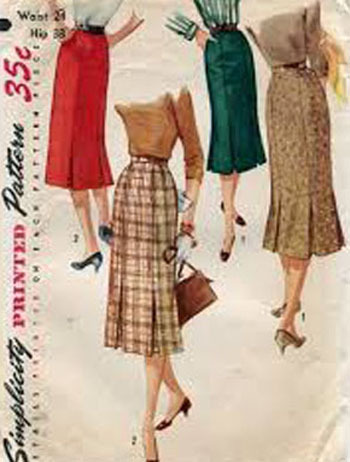 There are many vintage patterns available today. The truly excellent seamstress – I know several from the South and Central Americas – make their own patterns. There are also lovely vintage knitting patterns. It is never too late to start to learn the basics of stitching, something every girl and woman should know, even if they are in the workplace or a professional setting. When I sent your question to my good friend Serene Runkle, an always impeccably dressed young lady, she sent suggestions of online stores with more modest options. She also chose a few of their selections so you can have an idea of the more feminine and modern classic styles they offer. I also tried to find before and after clothing transformations from the thrift store featuring adults. Unfortunately, all the photos I found showed women with a penchant for turning long dresses into miniskirts; I could not find a decent photo even close to the young girl featured in the picture at right. Tailoring can do wonders. When shopping at consignment or vintage stores, look for well-made fabric or interesting prints. Do not be put off by seemingly endless amounts of fabric in what appears to be more of a tent than a dress on the rack; A needle and thread can fix that. Instead, envision how the color or print would look on you. Finally, I do not recommend every item of clothing featured in these websites. My intention is to offer a few resources to make it easier to find beautiful clothing that a woman can wear before Our Lord and Our Lady without shame. 1)	Pieces that are unsuitable on their own can be made so with slight modifications. For example, a sleeveless dress (example here) can be paired with a matching cardigan, bolero jacket, shrug, etc. that complements the style and fabric of the dress (like this). 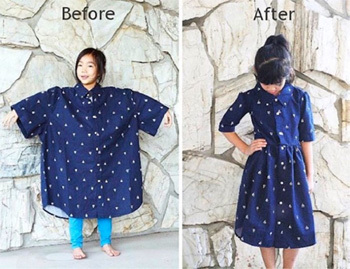 Also, if you find a pretty, potentially-modest piece that is too large or too low-cut, oftentimes it can be made suitable with easily made home alterations (even with basic hand-sewing skills) or by taking it to a seamstress/tailor who can make alterations. For example, I have taken a skirt with a slit on the side and made it acceptable by making a simple seam joining the two slitted sides together. 2) Second-hand stores are your friend. I have found here many really good quality used items that are from $5-$10 (e.g. Goodwill and Savers in my area are particularly helpful). Try searching on Google "Thrift shops near me." 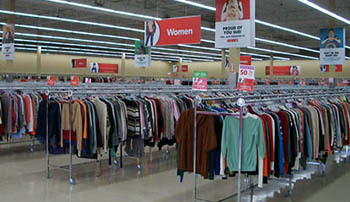 3) "Off-price" stores are your other friends, for example, Marshall's, Ross, TJ Maxx and Burlington Coat Factory. Many times, these have a larger selection of quality, potentially-modest clothing at a better price than the larger department stores. 4) Know keywords that will help your online search. Modest skirts are slowly making a comeback into the mainstream fashion world and there is actually a word for these: They are called midi skirts. Looking up “modest skirt” online might not get you very far, but if you search “midi skirt,” you will be surprised where that might take you (see what shows up on Amazon here). Also, for me personally, I have found that plain cardigans and printed skirts work well. So, when I look for cardigans online, I narrow the search with “cardigan, crew neck, 3/4 sleeve.” If this interests you, there are a few good cardigans here in many different colors. Another search could be for "vintage skirts" or "vintage dresses." Knowing the correct specifications is essential to narrowing your search and finding something that works for you. 5) Other specialty stores. H&M is a Swedish clothing store commonly found in your average shopping mall. Most of their things are immodest, but they have the occasional, vintage-inspired gems at good prices. Another really great store I found on Etsy.com is this Chinese-based store called Xiaolizi, with beautiful and elegant clothing that is handmade by a family of tailor-designers. We live in a revolutionary, anti-Catholic world, so it is difficult to find the perfect item, especially within a modest cost frame. It is important for this reason to try to look "outside the box" for solutions and try to see what works specifically for you. These are the suggestions I have to offer you, with the invaluable assistance of Serene and Salwa.